ABNORMAL PSYCHOLOGY: AN INTEGRATIVE APPROACH, Sixth Edition, is the perfect book to help you succeed in your abnormal psychology course! 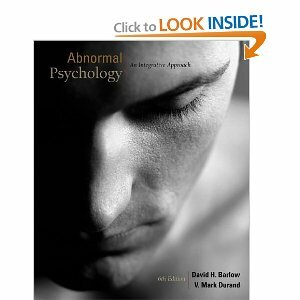 Authors Barlow and Durand show you how psychological disorders are rooted in multiple factors: biological, psychological, cultural, social, familial, and even political. You can test your understanding of topics with the text's built-in concept checks and chapter quizzes.